I haven't posted on my new blog yet that my husband is a tennis pro. Yep, sometimes it seems as if we live and breath it in our house. Nay...it's not to prominent but, it does get it's share of recognition. My son loves the game so he is totally following into his Dads footsteps. Tonight my husband and I are traveling to Cincinnati to the Western & Southern Financial Group tennis tournaments. 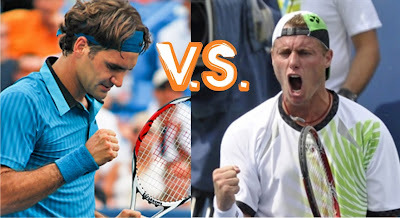 My husband just called me and is super pumped that his favorite player, Lleyton Hewitt will be playing against the all #1 world great Roger Federer. I'm glad his adrenalin is flowing because he( like how I state that)is driving 8 hrs. through the night to get there. Hello energy drinks and coffee!! !